A quick updated to the recently released Bminer 10.0.0 regarding Bytom (BTM) has been released. The new version addresses a problem with performance degradation over time when mining BTM, so that should not be an issue anymore. Currently Bminer is the fastest Bytom (BTM) miner out there, though sadly it offers only limited pool support, so you cannot use it on all of the available big pools and that limits its usability… something that also needs addressing in our opinion. So if you are mining BTM with Bminer, then it will be a wise idea to update and get the performance fix. We remind you that Bminer is a closed source Nvidia GPU miner available for Linux and Windows in the form of pre-compiled binaries and that there is a 2% development fee for Bytom (BTM), Equihash and Zhash coins, 0.65% for Ethash and 1.3% for dual mining Ethash and Blake. 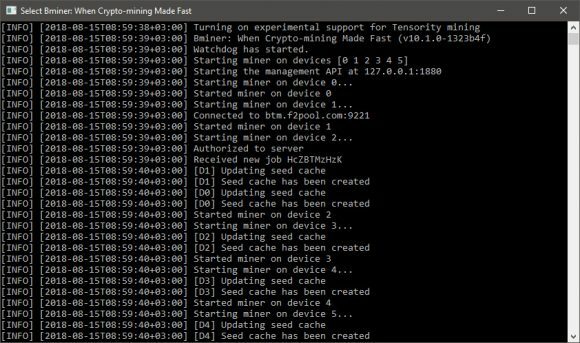 The other alternative Bytom (BTM) miner at the moment for the Tensority algorithm is BTMiner NebuTech, also only working on Nvidia GPUs like Bminer.